Recently, 2014 World Cup Golden Boot Award winner James Rodriguez ended an underwhelming three year spell with soccer club Real Madrid. Oddly enough, he immediately returned to his 2014 form after joining a new club called Bayern Munich. Real Madrid and Bayern Munich might be the two biggest soccer clubs in the world right now. So why did Rodriguez play poorly for one and excellently for the other? The answer is team chemistry! Team chemistry is vital. With it, teams prosper. Without it, teams fail to live up to expectations. As such, we’ve compiled our best tips for building the most vital ingredients to team success. Have you ever seen two teammates who always know where the other is on the field? That is the type of chemistry that is build through time spent together. As a coach, you can build this team chemistry by encouraging your team to spend time together off of the field. Organizing meals after practice, planning movie nights and scheduling overnight trips to tournaments helps to build subtle connections that keep your players working together. While practice is the time to develop new skills, it should also be a time to develop team chemistry. 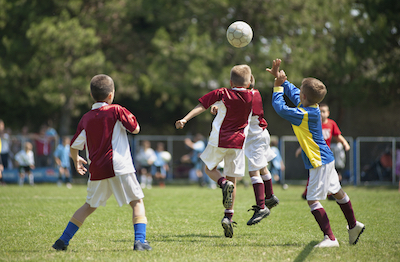 Games like possession and small sided scrimmages help players not only learn to play at game speed, but also help to build relationships between teammates. When players build chemistry, they expect each other to be on the same page. For example, if a through ball gets away and no one runs after it, it might seem like a poor pass. However, the passer might’ve expected a teammate to see the same opening they saw and make the run. As the coach it is important to not only recognize this change, but to encourage it. The more players play together, the more they’ll recognize these sorts of non-intuitive plays. Every team needs leaders. One way to find them is to appoint team captains. But captaincy isn’t about recognizing the best individual players. Rather, it is about rewarding those who help out the team on the field. This could be the central defender who keeps everyone’s head in the game, or the goalie who’s always the first to practice and the last to leave. Leadership isn’t about the individual; it’s about making those around you better. Communication is the backbone of any successful soccer team. From letting your teammates know whether or not they have a defender behind them to organizing the defense, a successful team needs players in constant communication. You can improve team communication simply by promoting its importance from the very first practice. It should be considered when choosing captains, since the coach shouldn’t need to constantly yell from the sideline. The importance of team chemistry cannot be overstated. Use these guidelines for the coming season to get everyone on the same page!